Globe of Science and Innovation: This big ball of wood houses the visitors’ education center for the European Organization for Nuclear Research. 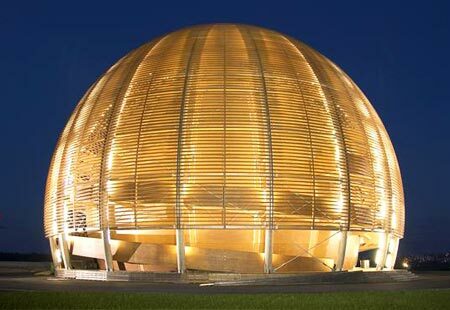 Located outside of Geneva, Switzerland, the landmark structure of the organization is about the same size as the dome of St. Peter’s Cathedral in Rome. 300 feet below the surface lies the 17-mile tunnel complex that will become the world’s largest and most powerful particle accelerator — the Large Hadron Collider — which will hum to life later in 2008.